The Zero Emission Vehicle (ZEV) program is a California state regulation that requires automakers to sell electric cars and trucks in California and 9 other states. The exact number of vehicles is linked to the automaker’s overall sales within the state. What is a zero emission vehicle? Under the ZEV regulation, three distinct vehicle designs are considered “zero emission,” though to varying degrees. Plug-in hybrid vehicles combine a conventional gasoline-powered engine with a battery that can be recharged from the electrical grid. Battery electric vehicles run entirely on electricity and can be recharged from the electricity grid. Hydrogen fuel cell vehicles run on electricity produced from a fuel cell using hydrogen gas. The program’s objective is to ensure that automakers research, develop, and market electric vehicles (EVs), which generate fewer global warming emissions than gas-powered cars, and which don’t produce tailpipe pollution (hence the term: “zero emission vehicle”). The California Air Resources Board (CARB) manages the ZEV program, although it has also been adopted by nine other states (Connecticut, Maine, Maryland, Massachusetts, New Jersey, New York, Oregon, Rhode Island, and Vermont). By directly requiring that automakers invest in clean technology, the ZEV program is considered one of the nation’s most forward-looking climate policies, and a driving force behind an expanding market with a current offer of over 30 zero emission models available to the U.S. public. The ZEV program assigns each automaker “ZEV credits.” Automakers are required to maintain ZEV credits equal to a set percentage of non-electric sales. Each car sold earns a number of credits based on the type of ZEV and its battery range. The credit requirement is 4.5 percent in 2018, which will require about 2.5 percent of sales to be ZEVs. The credit requirement rises to 22 percent in 2025, which will require about 8 percent of sales to be ZEVs. There are also restrictions on the amount of credits that can come from ‘transitional’ ZEVs that still have an engine. In 2018, plug-in hybrid vehicles (PHEVs) can only account for 55 percent of credits, meaning at least 45 percent must originate from battery electric vehicles (BEVs) or hydrogen fuel cell vehicles (FCEVs). For example, an automaker selling 100,000 cars in California in 2018 will need at least 4,500 ZEV credits, with at least 2,000 coming from battery-electric or fuel cell vehicle sales. However, this does not mean they’ll sell 4,500 electric cars and trucks, as most ZEVs generate more than one credit per vehicle (see below). Automakers earn credits by selling zero emission cars and trucks. The credit per vehicle varies with drivetrain type and electric range. From 2018 onwards, plug-in hybrids—which only partially drive on electricity—receive between 0.4 and 1.3 credits per vehicle sold. Battery electric and fuel cell vehicles receive between 1 and 4 credits, based on range. Total automaker ZEV credits in California grew substantially between 2013 and 2015. For example: the Tesla Model S, which boasts a range of more than 200 miles, is eligible for 3.3 credits, while the 84-mile range Nissan Leaf is credited at 1.8 ZEV credits per car sold. Because not all vehicles receive a flat 1 credit per sale, the ZEV credit percentage does not directly reflect the EV sales percentage. CARB’s most recent assessment of the ZEV program estimates automakers will need to reach less than 8 percent ZEV sales by 2025 to meet the 22 percent ZEV credit requirement. Manufacturers are allowed to carry over excess credits from one year to the next. Called “banking,” the practice has grown since 2012, thanks to extra credits and ZEV sales in California that outpaced the relatively low regulatory starting requirements. In addition, automakers can purchase or trade ZEV credits from other manufacturers. Because it only sells EVs and has no compliance obligation of its own, Tesla has produced and sold significant numbers of ZEV credits to other traditional carmakers. As of October 2015, manufacturers had banked over 240,000 BEV/FCEV credits and 94,000 PHEV credits, enough to comply through 2021, even if ZEV sales remained at the relatively low current rate of 3 percent. Assuming the same rate of credit accumulation, there will be over 300,000 BEV/FCEV and about 175,000 PHEV credits in manufacturers' credit banks at the start of the 2018 ZEV regulation. At current credit values and CARB assumptions, this represents credits equivalent to the sale of over 450,000 ZEVs. For the nine other states that adopted the ZEV regulation, the credit structure for electric vehicle sales remains essentially the same as in California. However, sales requirements in these other states are affected by two provisions in the ZEV regulation that don't apply to California: "travel" and "pooling." Use our EV emissions tool to see emissions in your area—or explore specific EV models. The travel provision allows automakers to receive credits in all other ZEV states for vehicles sold in California, proportional to the vehicles sales in the states. For example: if a car company sells a two credit ZEV in California, they receive two credits in a ZEV state that has the same sales as California and one credit in a state with ½ the sales of California. They receive the credits in all ten states (California plus nine others) despite only selling one vehicle (in California). As a result of the travel provision, auto companies have accumulated sizeable credit banks in states where they haven’t sold many electric cars or trucks. 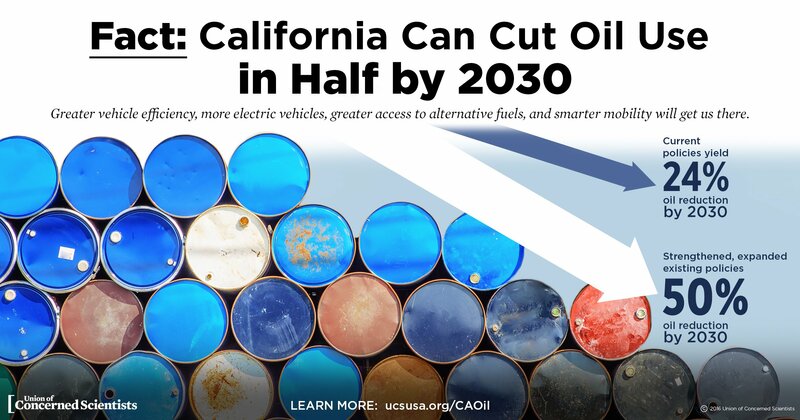 The provision has also created an incentive to concentrate sales of battery electric and fuel cell vehicles in California. However, in 2018 the travel provision will be removed, except for fuel cell vehicles. This should increase model availability and sales numbers outside California. The pooling provision allows automakers to over-comply in one eastern ZEV state and transfer the extra credits to another eastern ZEV state. Unlike the travel provision, pooling avoids the double-counting issue, and still requires that an actual vehicle is produced and sold before credit is rewarded and transferred. The Union of Concerned Scientists is dedicated to lowering emissions from the transportation sector and cutting US oil use in half. California’s New Climate Legislation: What Does it Mean for Electric Cars?